I love mysteries and historical fiction--so this novel seemed the perfect addition to my spring reading list. 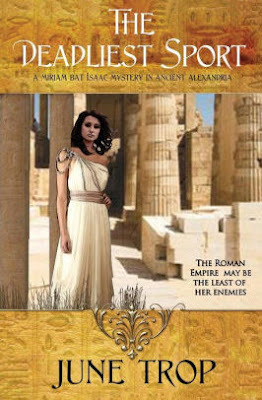 Set in Ancient Alexandria, with a female lead character--I was excited to read The Deadliest Sport by June Trop. What did I think of The Deadliest Sport? I am sharing my review today--so, check it out and be sure to enter for a chance to win an Amazon gift card in the book tour giveaway at the end of this post. Readers will Venture to Another Place and Time in The Deadliest Sport. This is the first book that I have read from this author--but, it is certainly not going to be the last. The author does an amazing job transporting readers to an ancient time and place. Readers will feel the swish of robes, hear the character's voices, feel the twists and turns & get lost in another time and place. Many times, historical fiction novels mix too much of our modern world with the historical content. Trop keeps the novel setting in check and her characters and their interactions well placed and realistic. The Deadliest Sport is a Standalone Novel. I loved the author's writing style. While, I picked this book up and read it without having read other books from series--I never had the feeling that I was missing anything from past character development or backstories. Having said that--I enjoyed the author's story development and writing style so much that I do plan to read other books from this series. History and Mystery Fans Should Enjoy this Novel. I did feel that I was transported back in time--but, it was to a time period of great interest to me. While there are twists and turns as the characters move through the mystery--making it ideal for mystery lovers and there is truly an historical setting that will appeal to historical fiction fans. Additionally, human nature and family bonds come into play making this a very well rounded historical mystery that modern readers are able to enjoy. Would I Recommend The Deadliest Sport? As a mother of 3 daughters--I love finding a series with a strong, intelligent, capable, realistic, lead female character. I enjoyed the author's setting and character development--especially as a reader coming in "late" to the series. I loved the story line and the plot twists--and would certainly recommend this book to fans of historical mysteries. Readers will be pulled into Alexandria and into the life of Miriam--and will not want to put down the book until the story draws to a close. 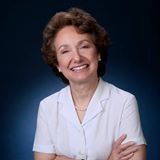 To read more reviews, please visit June Trop's page on iRead Book Tours. What a really unique cover! Can't wait to read this!